Most of us know by now that, the finest jade from Burma or Myanmar. And for those who missed the updates, the finest Burmese jade is referred to as 'Imperial Jade', interestingly the price per carat of these very rare pieces can be as high as what you would end up paying for diamonds! Jade has held an important place in Chinese civilization for thousands of years, it was about 3 centuries ago that the Chinese fell in love with fine green jade from Burma. So in all these sky rocketing price scenarios, is there something like affordable jade from Burma? What about the vast majority of gem lovers who love jade but, cannot afford those stiff prices. 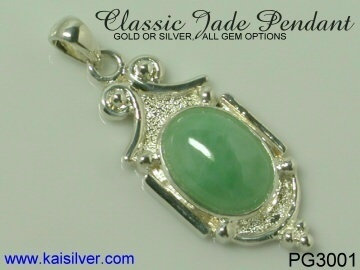 Kaisilver specializes in all gems, we are specifically drawn to the beauty of natural jade. 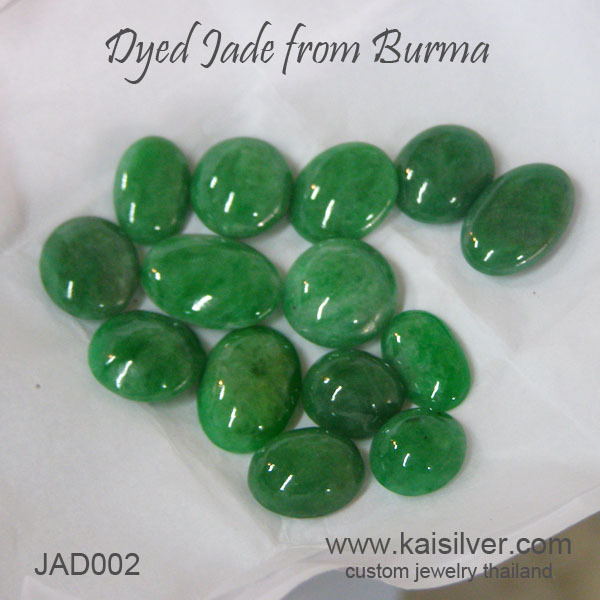 It is our mission to bring natural Burmese jade within the reach of a wide range of budgets. Affordable jade in our discussion would imply, jade that is mined in Burma and is priced in the 30 U.S$ to 100 U.S$ per carat range. Jade is often treated to enhance its beauty and there is nothing wrong with buying or selling treated Burmese jade as long as, there is a clear disclosure about the gem being treated. Another important factor is price, buyers should be paying for what the jade is intrinsically worth, not based merely on the external appearance of the gemstone. For example, a piece of dyed jade from Burma might resemble a high quality Imperial Jade stone to the untrained eye but, prices would and should vary widely. A 4 carat dyed Burmese green jade might sell for 150 U.S$ to 200 U.S$ for the piece (not per carat). Imperial jade with that color and 'beauty', could easily fetch 8,000 U.S$ to 12,000 U.S$ for the piece. At Kaisilver we source jade directly from the miners in the Northern parts of Burma, bargain for the best prices and ensure that each piece delivers good value for its price range. We provide examples of some interesting jade jewels with, natural jade from Burma. Treatment of gemstones is disclosed and we can work with your design ideas too. All jewelry is custom made in gold or 925 silver with good workmanship. All jade is natural, most of our jade is mined in Burma. 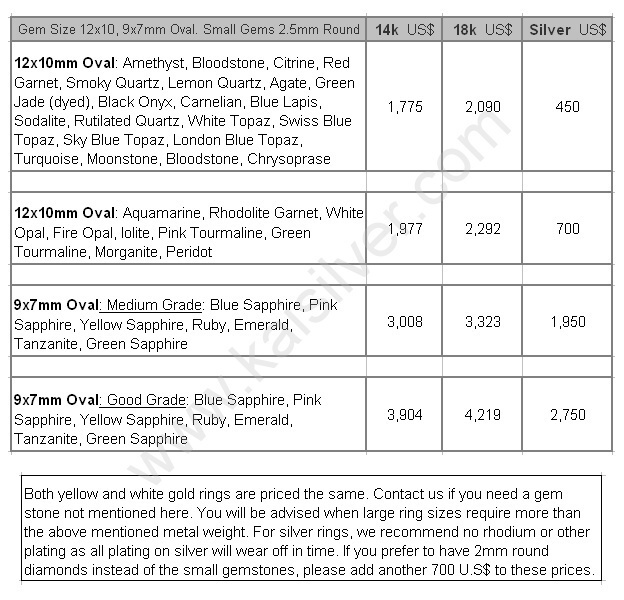 You can specify your requirement of Burmese jade when ordering. 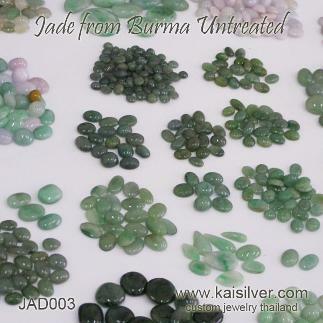 We focus on affordable natural jade gems from the Burmese mines. High quality imperial jade from Burma can be sourced on specific request. Gems are accurately and clearly described as being 'treated' or 'untreated'. All jewelry is custom made in gold or 925 silver with good workmanship. The designs for all jewelry can be yours or ours. Each jewel is fully custom made so, all preferences can be accommodated. Kaisilver: One of the most trusted online sources for fine custom made jewelry, we at Kai Silver craft both gold and silver jewelry with good workmanship and handpicked gemstones. 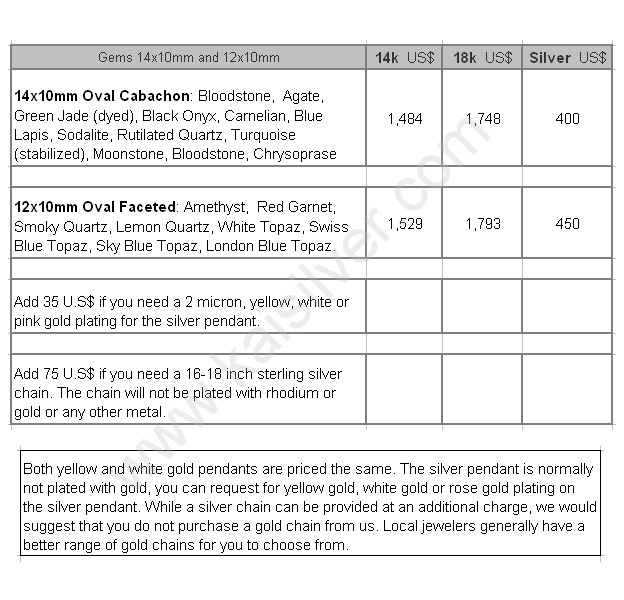 You can pick any design from our websites and order it in gold or 925 silver with dimensions and gems of your choice. We also welcome your own design ideas and sketches to be custom made. Being directly connected to most global gem mining operations and having preferential access to more than 200 million carats of cut and polished gems, ensures that we put no limitation on the gems that you select. Discuss your ideas and requirements with our experts at sales@kaisilver.com they will be glad to advise and inform you without, pushing you to make any purchase. The 4 century old claddagh legend perfectly depicted in thiis fine claddagh ring, shown with a 7.5mm heart shape dyed Burmese jade. 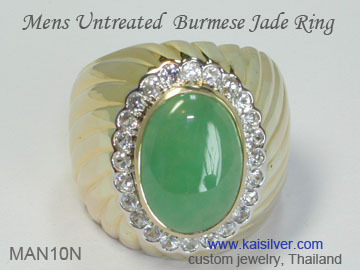 Request for price quote if you prefer untreated moderately priced jade from Burma for your ring. You can select from green and lavender jade. Available in all ring sizes and crafted in gold or sterling silver, both metals have fine workmanship. The gold ring weighs around 8 to 10 grams, the silver ring around 6 to 8 grams. 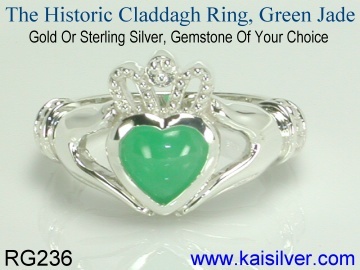 The Kaisilver claddagh ring is regarded as the world's finest rendition of the historic jewel, our gold and 925 silver rings can be made with the gem of your choice. Each ring is crafted by extremely skilled artisans and retains, the main features of the first ring made centuries ago. Also known as the love, friendship and loyalty ring the ring is today recognized as the most meaningful jewel in history, it is suitable for all occasions. This jade pendant comes with an interesting option for the jade gemstone, the image as shown has a 12x10mm oval untreated green jade gem. However if you do not mind getting a dyed green jade gem for your gold or 925 silver pendant, we will push the size of the oval gem to 14x10mm at no additional charge. The design for this jade pendant has a timeless classic look and feel, the gold and silver options will have the same quality of workmanship and gemstone. 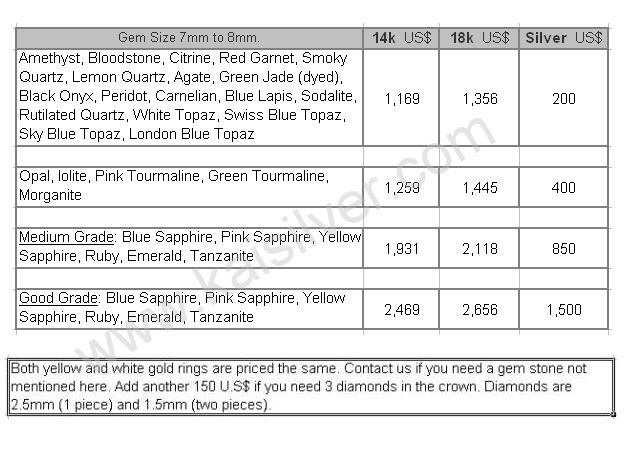 As the above price table shows, you have a range of gems to choose from. Buy the pendant for yourself or for someone special. The length of the pendant ranges from 3.5cm to 4cm (including the loop for the chain) depending on the size of the center gemstone. The silver jade pendant weighs approximately 10 to 12 grams and the gold pendant, weighs around 12 to 15 grams. Like all the other jewelry that we craft, your men's jade ring can be made with your choice of design and you can choose from gold or 925 sterling silver. The gems shown around the center jade gem in this ring are 2.5mm white sapphires, you can request for these stones to be kept out of the design. It is also possible to craft this ring with a smooth metal finish and without the ridges shown in the metal. Since all our jade gemstone jewelry is fully custom made, all ring sizes are available. The gemstone shown in the image is a 12x10mm oval untreated green jade, you can also request for a dyed jade gemstone at the same price. The band width of this MAN10N men's ring behind the finger is around 6-7mm. The men's 925 silver jade ring weighs around 15-20 grams and the gold ring, has a weight of approximately 18-22 grams. The silver or gold jade ring for men, has a gem mined in Burma. The jade gems shown in this image are all mined in Burma, they are natural and have not been treated in any way to enhance their beauty. While these are not the finest green jade gems, they are provide an affordable choice for jewelry lovers who prefer wearing untreated gems on a limited budget. We can provide high quality Imperial jade in untreated form if specifically requested. This affordable green has been dyed to enhance its color. You can request for dyed jade gems to for your jade ring or pendant. 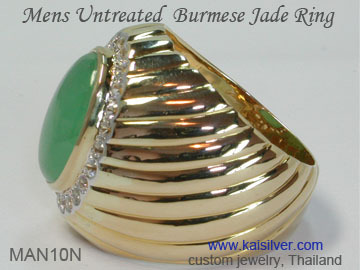 At Kaisilver, we will clearly mention whether the jade gems used are untreated or treated. High quality natural green jade that is untreated, can also be sourced on request, expect prices for such jade to be very high in the range of 500-2,500 U.S$ per carat.